This is not a book to my liking. While that is not a general requirement for books, it is a requirement for books I read. It´s not that I am unused to reading academic texts, but this is just too much, and fact is that when I read it I can´t avoid the feeling of being at a lecture where the speaker is so enthusiastic over his subject so he just don´t know where to start or really where to go. 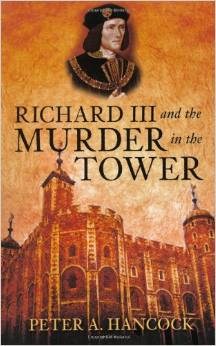 Peter A Hancock´s aim is to analyse the events surrounding the murder of Will Hastings by – even if by proxy – Richard III, or as he was titled at the time; Duke of Gloucester and Lord Protector under the minority of Edward V.
The author Peter A. Hancock want to find the answer to if Richard all along had the ambition to take the throne for himself, of if he was “just a man of his time” and acted on information given to him on the day of Lord Hastings death. He makes the assumption that it may be connected to Edward IV:s alleged pre-contract with Eleanor Butler, and spends a great deal of time attempting to prove that such a contract even existed, which is quite a fruitless endeavour, because even in the event it existed at the time, any evidence is long gone. But he goes through the connections of Richard of Gloucester and Edward IV to see how, where and when contact could have been made between Butler and Edward, he goes through William Catesby, well basically his entire family tree, as well as for Lady Butler, analyse the behaviour of Bishop Stillington who allegedly was the one who let the cat out of the bag; that is to say; revealed that there was a such a thing as a pre-contract which made the marriage between Edward and Elizabeth Woodville null and void, and thereby all their children illegitimate. While there are many non-fiction books which work perfectly to read as a novel, this is not one of them, it may be better served in rather small portions, if at all. It contains a lengthy reference list, but I find that Peter A. Hancock not to the extent I would like makes it clear in the actual text on what he based his assumptions, guesses and speculations on. This may sound like I belittle his work more than is required for making a point of not liking the book, but in this topic assumptions, guesses and speculations are all any of us have. The only “evidence” any of us have around the reason why Richard of Gloucester acted as he did when he assumed the crown for himself. This book is clearly directed to the most staunch of Ricardians, and while I don´t see Richard as a villain, I´m not one of them, which may be a reason to why I can´t bring myself to think this is a book that was really worth the “trouble”.